Sophomore Andrew Kew, attacker, has been named the Sunshine State Conference Offensive Player of the Week for men’s lacrosse. The award was announced on Monday, Feb. 20th. Sunshine State Conference Athletes of the Week are chosen from a pool of nominees for their performances during the week of February 13 – February 19, 2017. Athletes are nominated by Sports Information Directors of member institutions. Attacker Kew is being recognized in regards to his performance against Lindenwood University and Maryville University. With the loss against Lindenwood University (5-6), Kew assisted freshman Bryan Wright (attacker) with the first goal for both teams. Then with just seconds left in the first period, Kew scored his first goal of the game. He picked up his second goal to give Tampa a lead of 4-3. 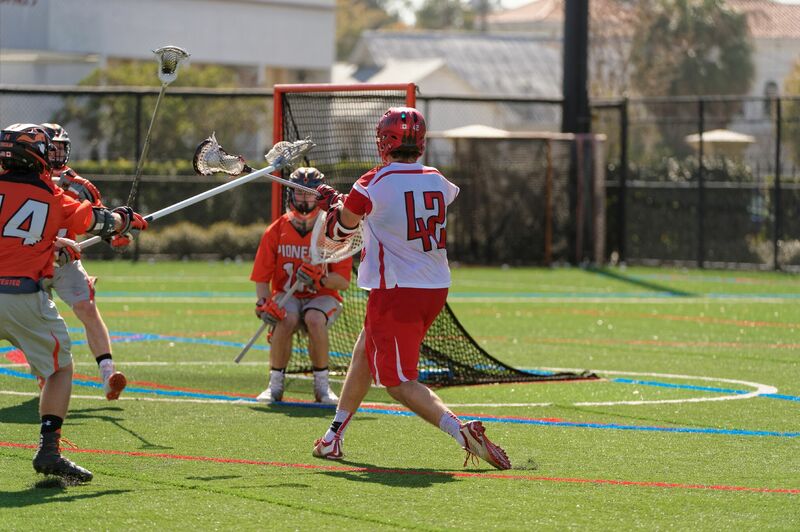 Later on in the third period he scored his third goal with an assist from senior Sean Giampietro (midfielder). Tampa held Lindenwood until the final minutes of the game, but a flag-down situation gave Lindenwood an advantage. Lindenwood ended up taking the game. Against Maryville University, Kew scored two quick goals from the get go. Then, he scored his third for the first period with 3:47 left on the clock. The team went on to the second period leading the game 7-0. The second period held 4 goals from sophomore Vetter (midfielder/attacker), freshman Trammell (midfielder), freshman Wood (midfielder), and freshman Pugliese (attacker). Kew scored his 18th goal of the season with an assist from Vetter in the third, and ended the third period with another goal assisted by Vetter. He scored the highest amount of goals, five, for the team that day, and Tampa took the game 16-2. This game was not only exciting for Kew, but head coach Rory Whipple as well. This win marked his 299th career win. The all-time winningest coach in NCAA Division II history has 71 Spartan wins in his six seasons with the team. Over weekend in total, Kew had eight goals and one assist. In just the last four games, he has had 19 goals for the season. And there still many more opportunities to score with a full schedule of games ahead. “Andrew is our leading goal scorer, and has a great work ethic. If he plays well this year he will be an all American,” Whipple said. This past weekend isn’t the first time the young player has been recognized for his achievements. In fact, in February of last year, Kew also received SSC Offensive Player of the Week. He posted six assists for 68 points last season and he is tied for the school record of goals scored in a game with eight, against Adelphi University last February. “Andrew is an excellent goal scorer, he’s good with carrying the ball, is excellent with angles and is a great team leader,” said senior attacker Conor Whipple. Last season, he scored five goals in the NCAA Championship semifinal game against No. 1 ranked Limestone, who defeated the Spartans 13-10. After his semifinal debut, he ended his freshman collegiate season with 62 total goals. This ties the single-season record set by All-American Jake Rooney back in 2014. In his first season with the Spartans, he played in all 18 games, and started in 17. Out of those games, he scored goals in 13 of them. At the end of his freshman year, he received SSC Freshman of the Year, All-SSC Second Team, and All-SSC Freshman Team. He led the Spartans in scoring, and finished second in the SSC scoring for 2016. Kew finished fifth in SSC Points per Game (3.71) and Shots per Game (7.57).